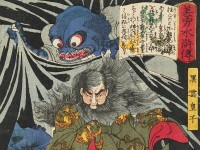 One of the oldest and most popular Japanese tales of the supernatural is the legend of the Hundred Night Demons, who appear between nightfall and sunrise. In this print the tale is combined with the story of the tenth-century Princess Takiyasha, who is helped by the frog immortal Nikushi to avenge the death of her father, the warrior, Taira no Masakado. She and her brother, Taira no Yoshikado, shut themselves up in her father’s Sōma Palace to plot a rebellion, but a warrior from a rival clan discovers their plans. Here the warrior challenges the Princess, surrounded by night demons and multiple ghosts of her father.